Microsoft makes audio and video files searchable with its new automated transcription feature. 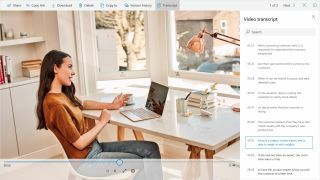 In an effort to help businesses be more productive, Microsoft has announced that it will add automated transcription capabilities for video and audio files to OneDrive and SharePoint later this year. The software giant is utilising the same AI currently available in its corporate video-sharing service Microsoft Stream to make OneDrive and SharePoint smarter while also making it easier for users to collaborate. Soon when a user is viewing a video or listening to an audio file, a full transcript (which is also searchable) will show up directly in the company's viewer that can support over 320 different file types. The new feature will make it easier for users to leverage their own personal video and audio assets as well as share them with others. Once a video is ready to be shared across an entire organisation, you can upload and publish it using Microsoft Stream. Transcription services and other AI driven capabilities such as in-video face detection and automatic captions will even continue to be available once a video is published. When it comes to security, all audio and video content will remain on Microsoft Cloud and will not be passed through any third-party services. Microsoft will also bring its powerful AI to search to determine where photos were taken, recognise objects and extract text in photos. This will allow users to search for images just as easily as they currently do with documents. Video and audio files will also soon become fully searchable using Microsoft's automated transcription service. While Microsoft has not given an exact release date for its automated transcription service, we will likely hear more once the new feature is closer to launch.